We are seeking a debate with people who live in this proposed new State. We know we've got the State pretty well correct, after all it's just geography. But if you live in this State you can tell us a lot of interesting things. - Who would be the Senator that represents the super-State for the whole of the Gulf of Carpentaria? - Does it have a decent airport that allows linkage to every other Capital City? - Does it have a hospital, a university? it appears not to have. We think that it should. The CSIRO has regions for projecting the impact of Climate Change. See https://www.climatechangeinaustralia.gov.au/en/climate-projections/futur... 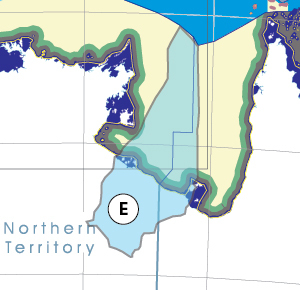 This state, Borroloola State (E), is one of the clear projections in a CSIRO cluster called "Monsoon North region". CSIRO's Monsoon North region coincides exactly with BloggerMe's K,J,H,G,F,E,D,C,AF.